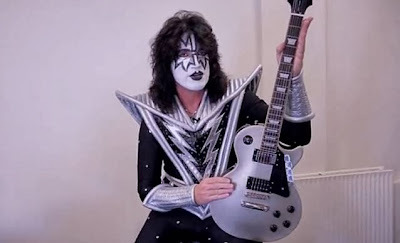 In January 2013, Epiphone kicked off its amazing 140th anniversary year with the release of the limited-edition Tommy Thayer "Spaceman" Les Paul Standard Outfit, a one-of-a-kind collaboration with KISS lead guitarist Tommy Thayer. Epiphone has now announced that they have "sold out" of the limited run of 1,000 Tommy Thayer "Spaceman" Les Pauls to their retailers worldwide. "Working with Tommy has been a highlight of our anniversary year," said Epiphone president Jim Rosenberg. "We're delighted that Tommy's signature Les Paul took off so quickly with fans. And the recent news that KISS has been nominated for the Rock And Roll Hall Of Fame makes this 'sellout' all the better. We hope to work with Tommy again in the very near future on another signature guitar run." The "Spaceman" features world-famous Gibson 498T Humbuckers with a covered 498T in the neck position and an open coil, double black bobbin Gibson 498T Humbucker in the lead position to create the unmistakable Les Paul sound. The hand-set neck delivers outstanding string-to-body resonance while the medium-jumbo frets add to the smooth and sustained tone. The top features a beautiful Silver Flake color finish and a black gloss finish on the back, sides and neck. The classic clipped dovewing headstock features a '60s style "Epiphone" in silver, "Tommy Thayer" on the bell-shaped truss rod cover and "Les Paul Spaceman" in silver lettering underneath Les Paul's iconic signature. A sleek black pick guard completes the modern look. "Having my own signature Epiphone Les Paul guitar is something I've dreamed about for a long time," remarked Thayer. "It's important for me to put my name on a professional guitar for serious musicians that sounds great, looks amazing and is affordable." Thayer worked closely with Rosenberg on every detail of the design. "Tommy has been a longtime fan of Epiphone guitars and wanted to be sure that his signature Les Paul was totally original and totally first class," said Rosenberg. "Tommy oversaw every last detail. We couldn't be happier with his Les Paul and we're thrilled that we'll be seeing it on stage with Tommy for many years to come."